This is the best way to save, when you have to pay out if the pocket for textbooks. This site is a goldmine when searching for an inexpensive way to obtain textbooks. Rentals or purchases are always so affordable. LOVE IT! 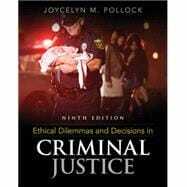 Ethical Dilemmas and Decisions in Criminal Justice: 5 out of 5 stars based on 2 user reviews.